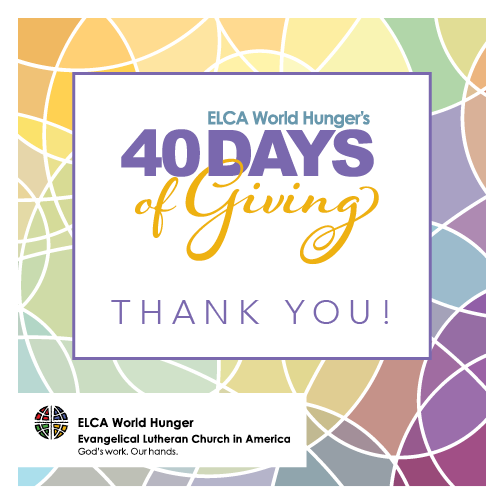 If you or your congregation participated in ELCA World Hunger’s 40 Days of Giving – thank you! Throughout Lent, ELCA World Hunger was lifted up through new levels of giving – spiritually, intellectually and financially. We cannot thank you enough. Be sure to spread the word; download ELCA World Hunger’s 40 Days of Giving thank-you graphic for use in your newsletter, bulletins and social media pages. Record floodwaters and tornadoes wreaked havoc in many regions of the U.S. Lutheran Disaster Response is working to assist those who have been affected.